At the November meeting of the Wayne County Gem and Mineral Club there was general bemoaning that the field season seemed over. That was until two members suggested that we visit the Lake Ontario shoreline on Sunday for one last outing. And so we did. In fact ten of us spent several hours walking the rocky coastline at a couple of our favorite haunts. It was our 22nd club field trip of the year, and probably our last. 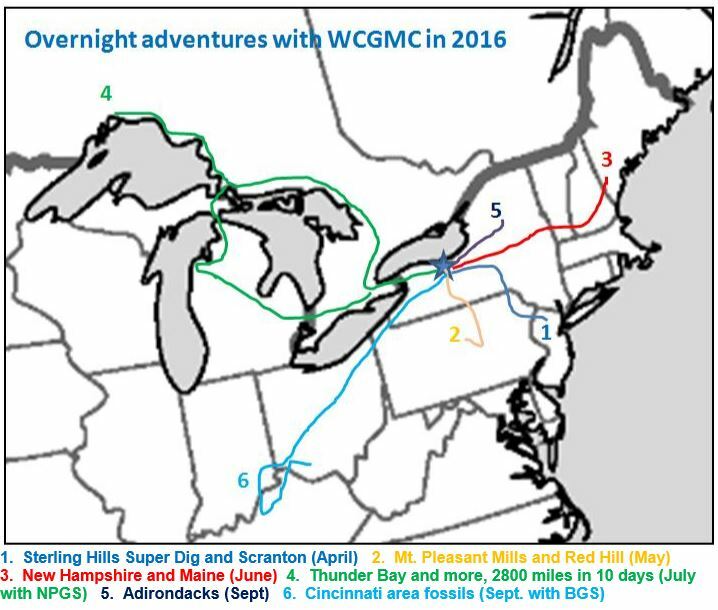 WCGMC rock heads, or is it hounds, often drive hours (or days) in search of this or that (see map at base of this post), and are already planning such trips for 2017. But, we should never forget that Wayne County has its own glorious locations to visit right in our own backyard and the numerous Lake Ontario rocky beach exposures rank highly in that regard. Crystal terminations may be lacking, rare minerals are scarce, and there are no agates to be found on the south shore of our Great Lake. However, that is made up for by the shear abundance of material and the tremendous diversity offered in the lake stones. You can find fossils brilliantly exposed in the eroding rounded limestone cobbles; straight cephalopods and gastropods are most common. There are gneiss boulders displaying ruby red garnets. The layered sandstones offer wonderful patterns. The alternating bleached and red sandstone rocks of all sizes and shapes are particularly interesting. Epidote and serpentinite offer green, feldspar is orange, and on it goes. A true petrology smorgasbord in a short afternoon stroll: clastic sedimentary rocks – sandstone (ss.) both layered and irregular red/grey, fossiliferous bioclastic limestone with gastropods (G) and cephalopods (C), igneous granite (blue arrows), metamorphic gneiss (red arrows) with dark red garnets. 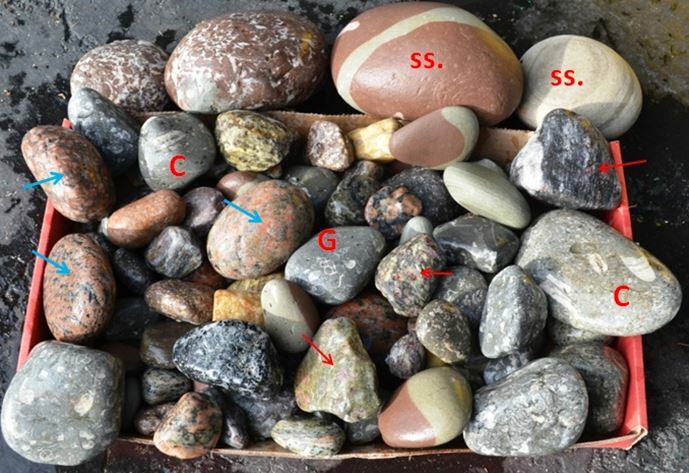 The diversity of rocks found In the same location is a direct result of the rather unique origin of the Lake Ontario beach rocks in the region. The same drumlins and other glacial features that give Wayne County its unique topography and character (WCGMC June 2016 newsletter) are also responsible for the nature of the Lake Ontario beaches along the county’s north boundary. At Chimney Bluffs the north-south drumlins are being aggressively eroded by the relentless action of Lake Ontario. With annual erosion rates of as much as 2-5’, an incredible amount of new material is churned into the lake water each year. Water level rises in the winter and the combination of wave action and freeze thaw eats into those wondrous chimneys of uncemented conglomeratic material that continental glaciation littered across western New York a mere 10-20 thousand years ago. The inside of a drumlin is exposed along Lake Ontario at Chimney Bluffs. The rocks within the glacial debris were somewhat weathered during transport trapped in ice, but that is nothing compared to the natural tumbler they are exposed to when set free from the drumlins and ground by lake water action. Clearly the glaciers were not terribly selective about what rocks they picked up and carried across the future US-Canada border. Whatever was in their way was unceremoniously captured in the advancing ice front. 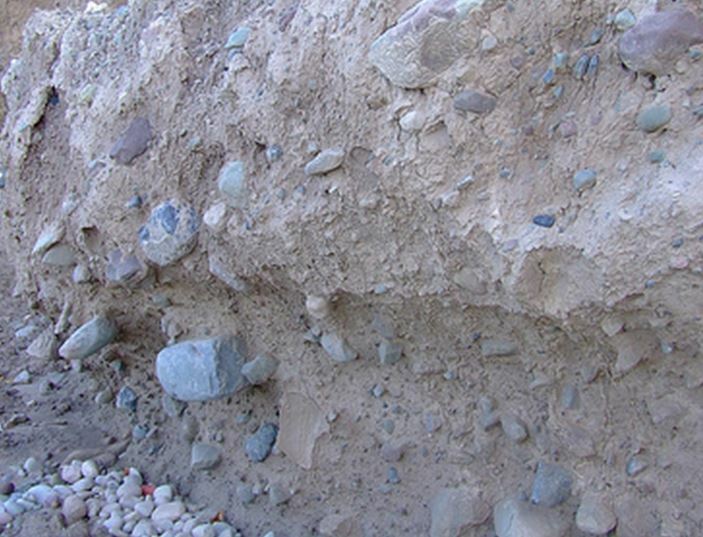 Some was ground to rock flour during the slow monotonous ice advance, but a significant amount of rock debris was trapped within the ice and protected from further erosion. This portion would be left in moraines and drumlins when the climate warmed and the glaciers retreated for the final time. Another interesting aspect resulting directly from this unique origin is that the diversity of rocks includes both very hard quartzite and sandstone rocks as well as relatively soft fossiliferous limestone. Most rocky coastlines result from geologic processes that involve significant sorting and extended periods of winnowing. Soft material is completely removed, and material of variable density is separated into different locations. This is not true along the face of the eroding drumlins of Wayne County. Much of what is seen this fall as rounded, tumbled cobbles was released from the drumlin just last winter or at most the one before. The beauty of this, of course, is that next year there will be an entirely different selection of lake stones to observe. So how did Ed Smith encourage ten folks to join him on the shores of Lake Ontario in the middle of November? It was not hard. He simply brought this football sized lake stone that he had found recently to the November meeting. 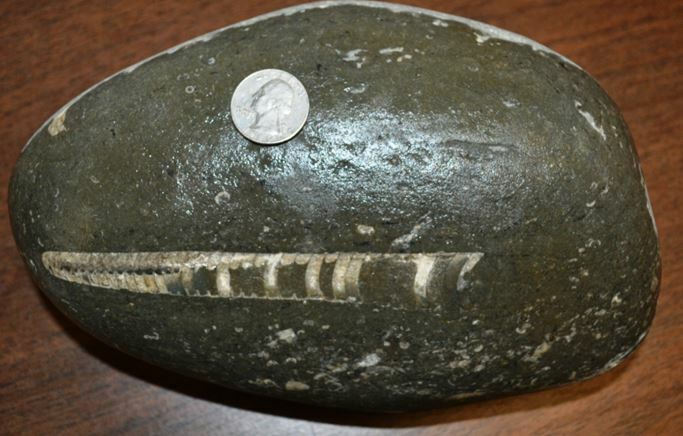 The straight-backed nautiloid in this beach stone was enough to tempt many to the field. Hi Fred. I enjoyed this post. 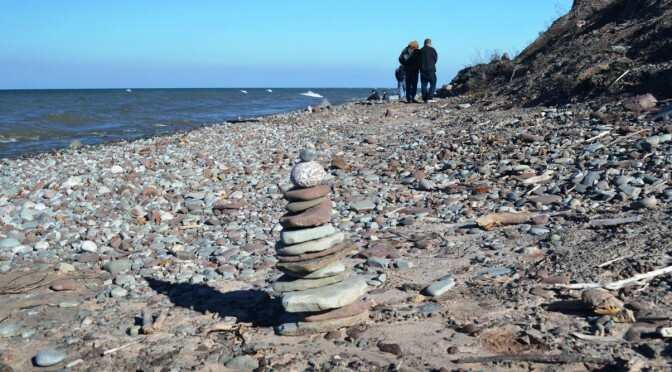 I came across it while looking to identify a few stones I collected along the shore of Lake Ontario during 4 trips to Chimney Bluffs SP last summer. I can attach some pictures, but to be brief, the main one I would like ID’d are the jet black stones that glitter. I have a particularly beautifully round one. Hello, my dad is recently retired and mentioned it would be fun to have a book to see what type of rocks/minerals are washing up on shore. There are lots of books about the other great lakes but not Ontario that I can find. Any recommendations on a general book that would be helpful other than the one in the newsletter in the link? Thank you and great site!!!! I do not know of a book just on Lake Ontario beach stones. Although the glaciers brought a diverse set of stones down with them and they are in the drumlins getting exposed by erosion, I think the fact that there is no super prize to find (i.e. agates, puddingstone, etc.) they have not gotten much attention. There are sandstones, fossiliferous limestones, conglomerates, and loads of various metamorphic rocks including garnet-gearing gneiss and epidote-rich unakite. Not sure where you are located, but the Wayne County Gem and Mineral Club has several members that go to the shorelines in and around Chimney Bluff SP often and perhaps a field trip with others would help learn the stones? visit http://www.wcgmc.org if you want to learn more about the club.